“Wow, this is just what I pictured a mountain home would look like!” exclaimed our friend visiting from Chicago. Which begs the question, what should a mountain home look like? I guess for most of us who come from somewhere else, we think it shouldn’t look like your typical suburban home near a big city. 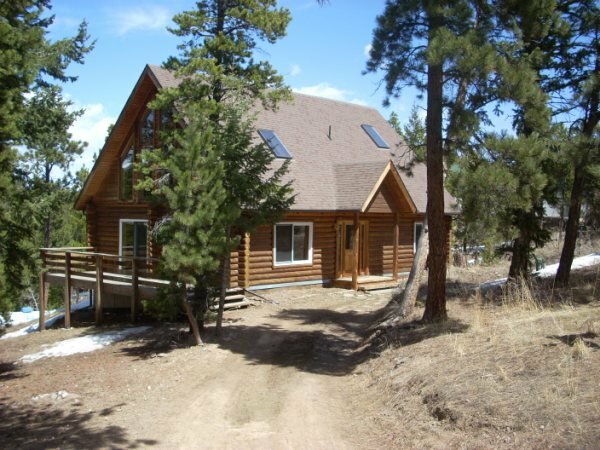 Ranch style, or craftsman would like out of place among the pine trees and snow-capped peaks. I joke to my friends that I fell in love at first sight with our home here in Nederland. As soon as I walked in the door, I thought, this is it. Because it did look like my dream of what a mountain home should be. Built log cabin style, wood was everywhere, including on the floors. Wood stove in the corner. A great room with 20-foot vaulted ceiling and huge windows, including skylights that allowed all that wonderful Colorado sunshine in, with lots of light. When Bryon and I got married, I told him I wanted a home where I could see the mountains from my back desk. Check — mission accomplished. Here’s the great irony of my vision of a mountain home. My quintessential mountain home is the home most likely to go up in smoke. Wood is the worst kind of material and incredibly vulnerable to wildfires. We found out the first winter that all those beautiful logs had gaps in them that allowed wind to blow in cold air. In summer, those gaps would allows embers to creep in and spark a wildfire. Windows are vulnerable too to heat and breakage during a fire and aren’t very energy efficient. In fact, if you build a new home in Boulder County now, you are required to offset the windows with solar panels. New homes are required to also have a sprinkler system inside as well. As I drive around Nederland, I’ve also realized mountain homes come in all kind of styles and floor plans. Contemporary split levels, small cottages, A-frames, and everything in between. What I notice more is what unifies homes in the mountains is how different they all are. When we were evacuated during the Cold Springs Fire, we stayed with friends in the suburbs of Denver. There were five different models of houses that seemed to repeat themselves block after block. But each mountain home has its own unique personality, complete with unique views. The truth is if a wildfire burned down our home, what we would rebuild would probably be completely different. But what wouldn’t be different is the feeling I get as I drive up Boulder Canyon, leaving the craziness of Boulder and the plains behind. I would still call wherever we live home.